Over the past few weeks I’ve been experimenting with APRS Messenger, a great PC based application that uses weak signal modes for Automatic Packet Reporting System (APRS). Traditional HF APRS uses 300 baud packet data for APRS messaging which isn’t really suited to HF communications. APRS Messenger is capable of decoding PSK63, PSK250, GMSK250, MFSK4 and MFSK16 and then sending them to the internet (iGate operation). These modes are much more suited to HF than 300 baud packet. Gerard, VK2IO (Sydney) and myself (Melbourne) ran some tests between our stations on 40 metres (about 700km) using the various modes with latitude and longitude encoded. Using PSK63, I was able to lodge quite a few location reports with Gerard while only transmitting 500mW RF out. Of course this was not consistent and in fact there were some times when we could not communicate with 20 W, although most nights this has been fine. Wade, VK1MIC also popped up on PSK63 with 5W from an FT817. PSK250 was not too far behind PSK63 in performance. A PSK63 position report takes about 12 seconds, where a PSK250 report takes about 4 seconds. At my location I have a high level of noise and also an electric fence ticking away and these modes coped well with it. Of more interest was constructing a light weight HF APRS station for remote area hiking. If there were a few HF weak signal mode iGates around the country, this could be viable method of remote area APRS. Recently, David, VK3IL and myself did some remote area hiking and David had set up a VHF packet APRS to HF APRS repeater in his car. This worked pretty well considering the terrain we were hiking in. See his blog for details on the hike. An even better modulation mode for weak signal APRS is MFSK16. I came across this interesting project from Mike, N0QBH. This was a low power, standalone APRS tracker using MFSK16 mode. I ordered some parts and built one up on a breadboard. For the PA, I just used a temporary 2N3866 amplifier that was producing about 60-70mW out from the DDS drive of about 1mW on 40 metres. The unit was calibrated and put on air. To my surprise, I received an email from Gerard, VK2IO to tell me he was decoding the occasional packet in Sydney! Conditions on HF have not been all that good recently either! Here is a photo of the rather messy lash up of the beacon. When the 5 Watt PA / LPF is finished and working, I will do a PCB and try and keep it as small as possible. 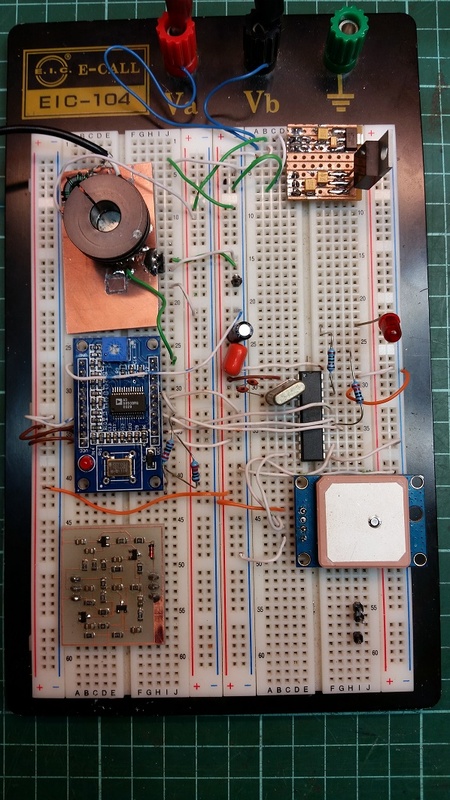 The GPS receiver, processor and DDS are all running from a 3.3V supply. Current drain is between about 60 and 120mA at 3.3V. The PA is running from 12V. Mike’s software shuts down the DDS and GPS between beacons to save power. At present I have not wired up the GPS shutdown, so it is running all the time. With a switching regulator, the whole thing should be quite low current at 12V or 3 cell Lipo. It’s a mess but it works! Here is the breadboard lash up of the beacon. It’s certainly not pretty, but it works. The GPS gets a fix pretty quickly indoors. This entry was posted in Hiking, Projects, radio communications and tagged APRS, APRS messenger, MFSK16, PSK250, PSK63. Bookmark the permalink. Very interesting, PSK63 would have some advantage as it can be sent via the paddle on a KX2 and from its memories. Of course an external GPS to Paddle convertor to format up a psk message would be required for tracking. Will APRS messenger handle different modes at the same time? That is if one transmission is in PSK and the next is MFSK it will happily pass both? For the KX2 and PSK63 APRS, I reckon you could have a GPS with a micro talking to the serial port of the KX2 directly. The KX2 utility can send PSK so cant see why a micro could not feed the KX2 port with APRS formatted PSK63. Yes, APRS messenger will decode PSK63/PSK250/MFSK4/MFSK16/GMSK250 without user intervention. Of course if a PSK63 stomps on an MFSK16 its likely nothing would be decoded. While keyboard to keyboard with Gerard, VK2IO, if sigs are good, I change my TX mode to say, PSK250 and he decodes it without doing anything at his end. All the decoders seem to run at once. You select your default TX mode.